NES Toki (USA) in 10:31.53 by XTREMAL93. 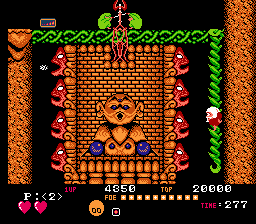 Toki was originally an arcade game and was popular enough that it was ported to many systems, including the Nintendo Entertainment System and the Sega Genesis. Here XTREMAL93 uses tool-assisted precision to soundly defeat the witch doctor and encounters many strange looking minions along the way.